I was encouraged today after reading information from the NAR (National Association of Realtors – realtor.org). During the first quarter of 2008 in the Pittsburgh Metropolitan area, prices have increased 2.4 percent. In the midst of a regular media report of bad news, this is wonderful. It certainly is a great time to buy and sell. “One out of three the metropolitan areas in the United States showed rising home prices in the first quarter, with only a small number of jumbo loan originations and higher foreclosures resulting in greatly mixed conditions around the country, according to the latest quarterly survey by the National Association of REALTORSÂ®. View the report showing the Median Sales Price of Existing Single-Family Homes for Metropolitan Areas from the National Association of REALTORSÂ®. I am a great fan of technology.Â I try to use it every way I can for business and personal use.Â It is just mind boggling all the things that can be done, especially on the internet.Â This morning, I had a great training session the company that I work for – RE/MAX.Â RE/MAX offers and extensive training and support network both locally and internationally.Â Â Â So I signed up for a free training session, called a webinar, that will help me do my job better.Â They sent me an email with the scheduled time and codes to login and call in.Â I could interact with other agents around the country and the trainer was in Denver, Colorado.Â Â Even if I was not able to make this training session, RE/MAX has free training videos online and more.Â Â I felt that I learned more, save time and energy – all from the convenience of my office. 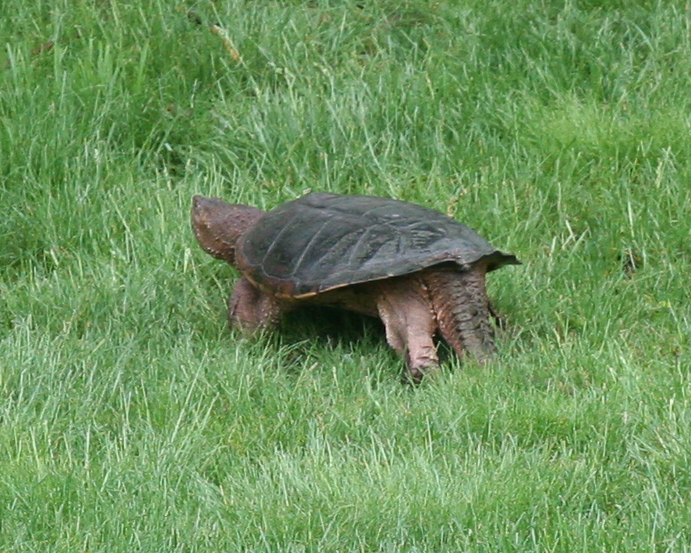 Well, this weekend my daughter was out cutting the grass and spotted the snapping turtle taking a stroll in the yard.Â Amazingly he was closer to the house but was headed to the back.Â I am not sure what he is up to.Â We actually had to mow around him. Looking out my back kitchen window this morning, I saw something odd in the yard. It was very big. I thought it might be a large piece of bark or a dead animal. I could not really tell. My husband thought it was maybe a rabbit. 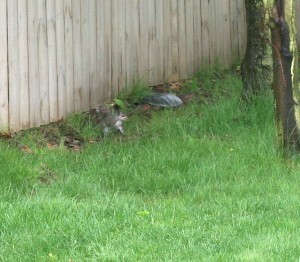 So he went out in the light rain about at least 50 feet from the house to check it out. Then to his surprise he hollers that it is a turtle. I sure did not expect that. 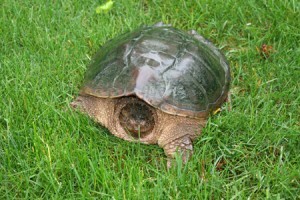 We have had some unusual creatures in my opinion for living in a housing plan. So being the photographer that I am, I immediately ran to gather up my camera bag. I shot a bunch of photos while he stayed sheepishly in his shell. 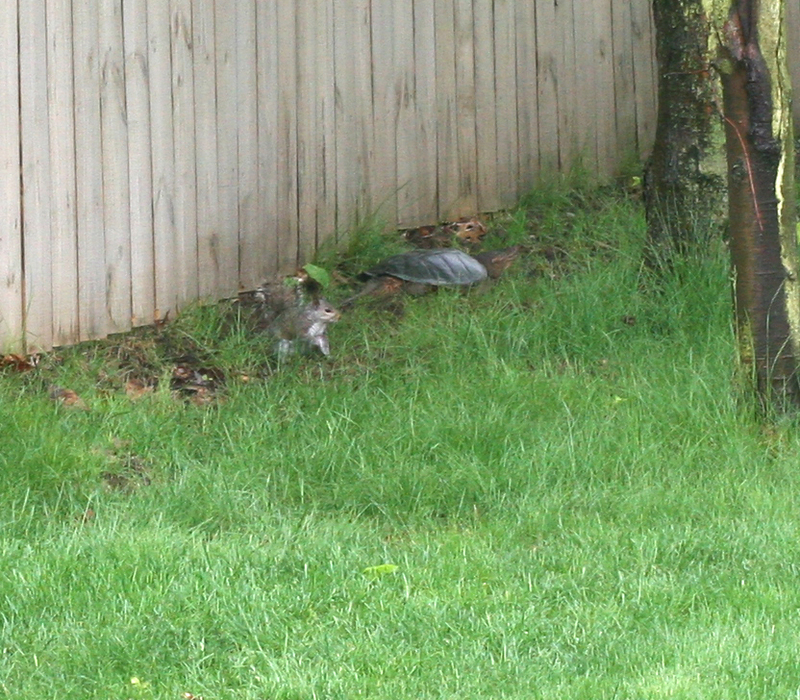 I then shot some from the house while he had his head extended out pretty far. 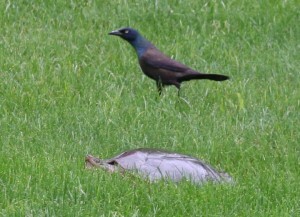 A black bird came along and was eyeing him for a few minutes and kept walking around him checking him out. About an hour after all the commotion he decided to get up and start booking. 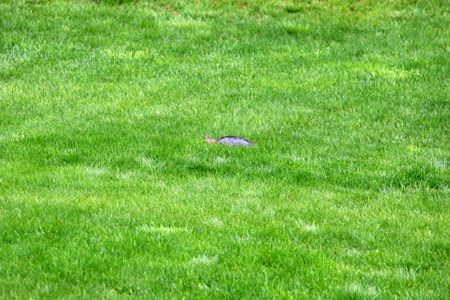 I thought it was pretty fast for a turtle. He then hung out for a little bit along the neighbors fence stopping and starting. 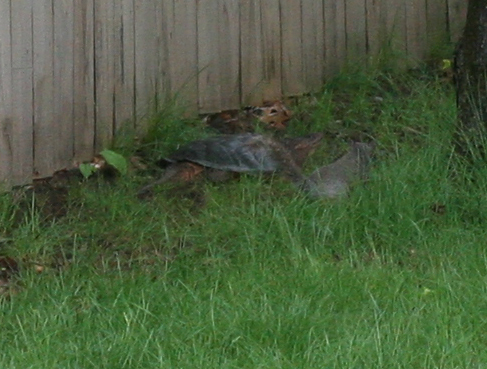 A squirrel came along to check him out. 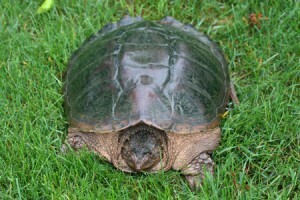 We later looked him up online to find out he was a snapping turtle as we were thinking he might be. We thought he was lost. He was headed out the back yard. 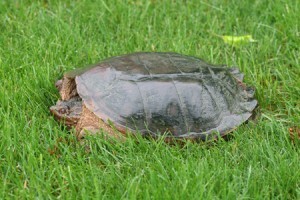 I suspect he headed back to the pond that is at least 100 feet from my back property line. Read more about the snapping turtle. A home that I recently showed went under contract to be sold. It is a great house and had some upgrades. This home is new and has not been lived in very long. The neighbor (who is a “For Sale by Owner” – FSBO) has virtually the same home next door. The FSBO does have a fire place and appliances and the neighbor has a deck. The prices were both very close. The FSBO was very discouraged because he did not even get the opportunity to show his house to thes buyer’s for his neighbor’s house. He had a sign and everything. It goes to show you in just this instance that it is important to use a Real Estate agent and specifically one that is a REALTOR. Buyers usually have a business relationship with their agent and in often agents will not show a FSBO. A home is more accessible to an agent that is officially listed with an agent among other things. Real Estate agent’s provide many services. As I mentioned before, on average you will get more than 16% more for your home using a Real Estate agent than without one. When using a Real Estate agent, your home is entered in the Multi-List service for your area. In the West Penn Multi-List service there are over 8000 Real Estate agents who subscribe as well as many buyers who subscribed to the search services. What a great way to expose your home and that is only one thing. This is what you are getting when you higher a REALTOR. Just to let you know – not all Real Estate agents are REALTORs. Make sure you ask.